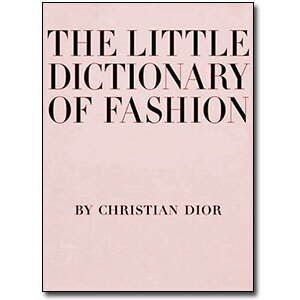 Biz Books - The Little Dictionary of Fashion: : A Guide to Dress Sense for Every Woman by Christian Dior. Christian Dior reveals the secrets of style in this charming handbook that no lady should be without. An indispensable guide that covers everything from what to wear to a wedding and how to tie a scarf to how to walk with grace, The Little Dictionary of Fashion is full of timeless tips. From afternoon frocks and accessories to traveling and tweed, Dior’s expertise ensures every girl will know the three fundamentals of fashion: simplicity, grooming, and good taste. Published for the Victoria and Albert Museum's Golden Age of Couture exhibition celebrating the 50th anniversary of Dior's "New Look" and illustrated with delightful photographs and drawings, this handbag-sized classic is the perfect gift for style-conscious girls. Christian Dior was born in France in 1905. After serving as an officer during World War II, he opened The House of Dior in 1946 and launched the “New Look” in 1947. Dior brought the center of the fashion world back to Paris, where he reigned over the fashion world until his death in 1957.